Thankfully, no game today. I can only take so many consecutive blowouts. Lou and company better spend the day off tightening up screws, remembering how to count, learning the rule that says you score runs by getting runners to home plate  not by leaving them on the diamond. That sort of thing. And so the Cubs enter June seven games under at 22-29, but only six games out of first. Such is the NL Central. There's still time to turn the season around, and the forthcoming series against Milwaukee (June 4-6) is an opportunity to make up some ground. I only hope it's just coincidence that those games fall right in the middle of National Headache Awareness Week. There are a few factors, however, that would seem to suggest a turnaround could be coming for the Brewers. Milwaukee is 18-8 at home, the best home record in the National League and third best in baseball behind the Red Sox and Angels (tied at 18-7). There's another factor that could help the Brewers. After playing six consecutive series against teams with winning records, the schedule over the next two months appears to be a bit less formidable. After Wednesday's game against the Braves, the Brewers begin a stretch during which only six of their next 38 games are against teams with winning records (based on records through Tuesday). Milwaukee has a three-game Interleague series at Detroit (June 12-14) followed by another at Minnesota (June 15-17). The Tigers began play Wednesday in second place in the American League Central with a record of 30-21, while the Twins were fourth at 26-25. The stretch also includes series against Texas (currently in last place in the AL West), San Francisco (tied for last in the NL West), Kansas City (last in the AL Central) and Washington (last in the NL East). Twenty-six of Milwaukee's next 45 games are at home. That makes the Milwaukee series of even greater importance. The inhabitants, a k a Cubs players, just got through holding a players-only meeting in the wake of what might have been their worst-played game of the season, a 9-4 loss to the Florida Marlins the previous night. The players meeting broke up about 4:15 p.m., at which time Cubs president John McDonough, general manager Jim Hendry, assistant GM Randy Bush and club director Crane Kenney marched through the clubhouse and into Piniella's office for a meeting that lasted nearly two hours. "Hopefully this is a bottoming-out game," Piniella said. "We didn't hit. We didn't pitch. We ran the bases good tonight." That was a bit of morbid humor based on the poor play of Tuesday, when the Cubs didn't run the bases so "good." But on a Wednesday night with the wind blowing out, their hitters managed just 5 singles, while the Marlins hit 4 homers, 3 against Cubs starting pitcher Ted Lilly (4-3). Michael Barrett will be getting some time off, for obvious reasons. Barrett's not signed for next year, and with Jake Fox tearing up the minors, Barrett could be seeing a one-year deal in his future while Fox gets some polishing at Triple-A in 2008. Remember that Zoloft article I wrote a few weeks ago in response to a series of crushing defeats? Well, those who commented on the post clearly understood it was written in jest. Some pharmaceutical blog ... not so much. Do Cubs owners and fans know that Zoloft increases the risks of suicidal behavior? Will the FDA allow toxic prescription drugs that carry Black Box warnings about life-threatening risks to be marketed like jelly beans? The blog then went on to quote the entirety of my post, taking it word for word. I just about peed my pants laughing. We received several inquiries suggesting that the Chicago Cubs news item reported by the Associated Press was a hoax--The report (byline AP) reported that the Cubs made a deal with Pfizer which would give ticket stub holders a 20% discount on its suicide-inducing drug, Zoloft. One of our colleagues has a call into Cubs but no response so far--If it turns out to be a hoax we will notify you. How dumb can people get? A similar thing happened last year at my old site in response to a humorous article I wrote about Dusty Baker taking prescription growth hormone from his son and selling it to Barry Bonds. It wound up on a message board, and it was days before someone politely pointed out that the article was a joke. I got a good laugh out of the whole thing, and it sure beats discussing yet another bullpen meltdown. Perhaps I'm just being cynical, but isn't it fitting that the Brewers lose six consecutive games, and the Cubs only gain a game and a half in the standings? The Brew Crew, finally having hit a wall after a too-good-to-be-true start, doesn't look much like the class of the NL Central anymore. After beating up on poor teams for much of the season  their record against sub-.500 teams is 22-9  the Brewers have been overmatched against the real top dogs in the NL. The Dodgers (29-21) took two of three, and then the Crew was swept out of San Diego (29-21). Atlanta, riding high in the East at 29-22, has already taken the first game of three from Milwaukee. Not surprisingly, the Brewers are 6-14 against supra-.500 teams. And yet, the Brewers still look poised to take the Central. The Astros have lost eight in a row, and Pittsburgh, of all teams, sits in third, half a game behind the Cubs. As for St. Louis and Cincinnati... It'll take a miracle to turn them around. And then there are the enigmatic Cubs. With three teams within half a game of first place in the West, and Atlanta only four back in the East, it's safe to say the Wild Card will not come from the Central. The Cubs' only path to the postseason is through a division title, something that is looking increasingly doubtful after the last week of play. The Brewers lose six in a week  and the Cubs go 2-5. If the bullpen (or the offense with runners in scoring position) had any competence at all, the Cubs could easily have gone 5-2 and moved within two games of first. Though Piniella has a history of having little patience for relievers who frustrate him, he had a long, friendly conversation with Eyre before the game Monday. 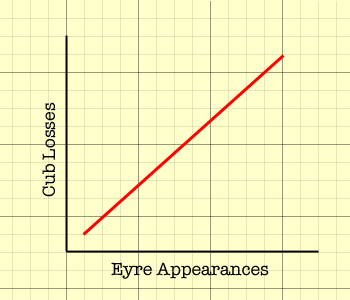 How many more games does Eyre have to lose before something is done? Hendry and Piniella didn't hesitate to send Neil Cotts down to AAA with an ERA nearly half of Eyre's. I'm dumbfounded. It's a bad enough feeling to get shut down on offense, but by a pitcher who enters the game with an ERA over 7? That's just shameful. 7:05 game tonight. Marquis vs. Willis in a battle of 27-loss teams. Sean Marshall is up from Iowa and will move into the rotation, swapping roster spots with Neil Cotts. Angel Guzman takes Cotts' place in the bullpen, apparently to be groomed as a closer, says Paul Sullivan. Dempster is now supposed to mentor Angel Guzman to take over his role, even though Guzman has never been a closer, is not ready to pitch in back-to-back games and has been winless in 13 career starts, an indication he's still learning his trade at the major-league level. Game in a couple hours: Hill vs. Peavy in San Diego. Seemed like every time a Cubs fan celebrated a triple down the right-field line or a dramatic home run, a Sox fan would fall back on the semi-recent World Series title as the ultimate comeback. Even after A.J. 's grand slam Sunday, there was much talk about the past. Have to admit I did it myself. As I endured some good-natured heckling from Cubs fans after D-Lee's grand slam Saturday afternoon, I couldn't help it. "Let me ask you something," I said to a couple of guys in the beer line. "What's it like when your favorite team wins the World Series? Oh, I'm sorry, you wouldn't know because IT HASN'T HAPPENED IN YOUR LIFETIME. In fact, the last time it happened, there were 46 states." In the middle of the usual trash-talking in the men's room -- the place where intelligent debate goes to die -- one Cubs fan invoked the immortal words of Mike Ditka: "Only losers and cowards live in the past!" Right. Plus historians and smart people, and philosophers and poets. First: Let it be known that I get far more worked up about the Cardinals coming to town than the media-inflated circus that has become the "Crosstown Classic." The crux of Roeper's argument centers on the use of the past for validation in the future. 'Hey, look what we did,' Roeper seems to say. 'Aren't we great?' This sense of entitlement, that somehow a championship two years ago justifies supposed superiority, is irritating beyond belief. The past has its uses, whether predictive or didactic in nature, but can do NOTHING to validate present events. For example: Rod Blagojevich won reelection, but does that alone make him a good governor NOW? Certainly not. The past is just that: The past. It is gone, never to be seen or experienced the same way again. Memories will remain, and lessons can be learned, but an action in the past stays there. The present and future should be of greater concern. So when Roeper says that "historians" and "Sox fans" both live in the past, he fails to note the reasons for doing so. Historians draw from the past to learn and document, while Sox fans belittle. Historians research to verify past events, but Sox fans use 2005 to verify current claims ('We won in '05, so we're better than you'). It is an important distinction, and one that Roeper fails to make. Yes, the Sox have won much more recently than the Cubs, but that fact alone has little to do with the just-concluded Cubs-Sox series or, in general, the current state of each team. With the Cubs having taken two of three from the Sox, I know I shouldn't complain. But Carlos, when are you going to come around? He's averaging more than three walks per start, and his ERA is almost six! It's hard to believe this is the same guy who said he deserved Zito money this offseason. Wait, I take that back. Carlos probably still wants Zito money. I'm really liking Alfonso Soriano in the middle of the order. This was something I strongly advocated for over the winter, as there is no doubt that Soriano would help create more runs hitting in one of the 3-4-5 spots. Plus, Ryan Theriot and his .364 OBP are far more suited to the leadoff spot than Soriano and his .333. For all of the success of Ted Lilly and Jason Marquis, Jim Hendry's best offseason deal just may have been the resigning of Aramis Ramirez. He's avoided his usual slow start, and with 11 home runs is on pace for nearly 50. His seven hits in the series had much to do with the Cubs' success. And while Ramirez may never win a Gold Glove, his defense has become very respectable. And about Lilly: Henceforth, an outing of at least seven innings in which three or fewer runs are allowed shall be know as a "Ted Lilly" – as in, "He threw another Ted Lilly" – because that's all Lilly ever seems to do. I hate to say it, but, as I've long predicted, I think this will be the norm from Marquis. Stealing a line from Jon, it looks like Marquis' eyebrow-raising start to the year really was just something to be tweezed. Ryan Dempster starting? Um, sorry Lou, that one's been tried already, and, well, there's a reason Dempster ended up in the bullpen. Would it surprise me if Derrek Lee suddenly showed up at the ballpark with wings and a halo? Nope, not one bit. The Cubs are off tomorrow, then begin a very tough stretch against San Diego (24-20), Los Angeles (25-19), Florida (21-23), Atlanta (26-18), Milwaukee (27-17) and then Atlanta again. Yeesh. If the Cubs come out of that over .500, I'll be beyond impressed. CHICAGO (AP)  The Chicago Cubs today announced an unprecedented partnership with Pfizer Inc. and its antidepressant Zoloft that will make the pharmaceutical company the Cubs' foremost advertiser and sponsor. In a statement, Manager of Sponsorship Sales Matthew Wszolek said the partnership will target the immense, untapped market of depressed Cub fans. "This deal was a no-brainer, and it's really unfortunate that we didn't think of it earlier. Had we realized sooner that the fluctuating emotions, sadness, irritability and cynicism that characterize so many of our fans was actually depression, not passionate fandom, we'd have joined forces with Zoloft years ago." The full terms of the deal were not disclosed, but Wszolek did reveal several product tie-ins. "In July, we're going to start an affiliate program. Fans will be able to exchange their ticket stubs for a 20% discount on their first two Zoloft orders at all major pharmacies. And beginning in June, WGN's Cubs postgame show will be sponsored exclusively by Zoloft. "We're also hoping to offer Zoloft giveaways to the first several thousand fans at select home games, but we've run into a few delays with the federal government and the whole prescription-only rule. But our legal team should make short work of the complications. Working around the law is their specialty." Many business analysts are calling the deal a clear attempt by the Cubs' owner, Tribune Co., to turn as much profit as possible before the team is sold after the 2007 MLB season. "And, I mean, who can blame them?" Chicago-based analyst Edward Milford said. "The way the Cubs are playing, this deal could net tens of millions for each side." Everything was going right for the Cubs tonight. Alfonso Soriano was the only Cub batter without a hit, missing out on the offensive fireworks that included a monstrous Aramis Ramirez grand slam to deep, deep left. If you ever need to define "mammoth home run," just play that clip. Carlos Zambrano finally turned the corner with eight outstanding innings. He's still not striking out batters like the Z we've come to know and love, but hey, I'm not complaining. Even Scott Eyre managed to be less-than-awful for the day with an uneventful ninth. Rich Hill throws tomorrow against Jorge Sosa, who's unbeaten in two starts this year. You see, there is frustration, and then there is Frustration. It's like the difference between trying to close the door of a too-stuffed closet, and watching a four-run lead dissipate at the cry of "Ball Four!" They're both on the list of Things That Frustrate, but gosh darn it, for all the subtle torture of that closet door, whispering, if you listen closely, snide remarks about your very manhood, it's nowhere near the top of the list. It's games like tonight's that find their way to the top, right alongside poor fundamental play and general incompetence. That game was just so winnable ... c'mon Michael ... just one strike ... please? Sigh... Excuse me while I pull the rest of my hair out. Might as well finish the job. I'll be the first to admit it: I hardly watched any baseball last week thanks to a really busy schedule. Really, the only thing I did keep up with was the scores. Shamefully, I didn't even know Felix Pie had been sent down until yesterday afternoon. Monday: The Cubs, fresh off a weekend sweep of the Nationals, had Monday off. The papers were full of fluff ("Rave review for Ryan," "Lou has the moves"), and the biggest worries were finding playing time for Matt Murton and Felix Pie. It's safe to say that Optimism was Abound. Tuesday: Ted Lilly was excellent again, with seven innings of two-run ball, but Ryan Dempster couldn't hold the Pirates (the Pirates!) scoreless in the ninth, and the game went to extras. Neil Cotts picked a terrible time to give up his first run of the year, and the Cubs lost in 15 innings, 4-3. Rather ironically, the Daily Herald ran an article titled "Cubs' closer Dempster rebounding from nightmarish 2006 season" that very day. It's a cruel, cruel world, folks. Wednesday: Jason Marquis threw a 109-pitch complete-game shutout. Alfonso Soriano homered to lead off the Cub first, and that was that. But I – curse you, busy schedule! – didn't see a single pitch. Marquis continues to dominate, much to my disbelief, and Hendry's much-lambasted deal is paying big dividends. Thursday: Felix Pie was sent back to Triple-A to "learn the strike zone." Simply put, Pie isn't ready for the majors. I said it over the winter, and I said it during the spring: Pie needs more time. At the Cubs Convention, Mike Quade, Pie's manager last season, also made it clear that Pie still has problems to work out; "Raw" was the word he used. Letting Pie get regular at-bats in the minors is the right move. Meanwhile, Carlos Zambrano had another tough outing, and he wasn't helped by Matt Murton's outfield gaffe. But the coaching staff thinks they've discovered Zambrano's problem: mechanics. But even with the loss, the Cubs remained in good shape with a .500 record. I wouldn't have complained. Friday: But then the Cubs went to Philly. Rich Hill got roughed up for just the second time this season, but even so, five innings and five earned runs is hardly unbearable. Alfonso Soriano and Aramis Ramirez each hit solo home runs, the only scoring the Cubs would manage in a 7-2 loss that dropped the team under .500. Saturday: Yesterday's game, one I again didn't see, just sounds pretty painful. The Cubs entered the seventh inning down four runs, but scored six to go up by two. The bottom half of the inning was going quite smoothly, until Aaron Rowand singled with two outs to start a Philadelphia six-run rally. The Phillies would win 11-7. I hate to say it, but that was one game I'm glad I missed. And yes, Bob, you really did stink. Oh yeah, I almost forgot: Happy Mother's Day, Mom! The Cubs' skid is just cruel coincidence. I'm really, really, really short on time this week, as in I may not get another post up until Thursday or Friday. Far from preferable for anyone, but it cannot be helped. But remember, when that tear rolls slowly down your cheek as you lie awake at night with visions of Cubbie Blue toasters dancing through your head  I'm crying, too. It was a long climb, but the Cubs have done it. And it sure feels good. Feel free to discuss; I'll have more later. When Carlos Zambrano put the Cubs down by four right out of the gate, I'd normally be tempted to sigh heavily and wonder why I put myself through such misery day after day, year after year. But that didn't happen yesterday, not for me and (thankfully) not for the Cubs. This club has shown me something over the past week, something I haven't seen in a while from a Cub team: Resilience. It feels foreign, really. Even earlier in the season, a first inning four-run deficit meant Game Over, Please Try Again Tomorrow. But not yesterday. Instead, the Cubs came back with three in the third and two in the fourth to take the lead. Zambrano settled down after his now-customary one poor inning per start, and didn't allow another run. The bullpen, anchored by 2.1 scoreless innings from Bob Howry and Ryan Dempster, took care of the rest. And even if the bullpen hadn't kept the lead, I wouldn't have given up  not with the aura exuding from a club now just one game under .500. 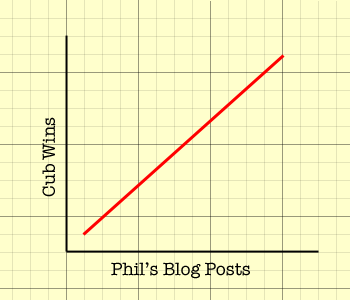 Not surprisingly, the Cubs' sudden upswing has coincided with some much needed clutch hitting. Four of the Cubs' six runs yesterday came with two outs. In a little over a week, the Cubs have raised their stats with two outs and runners in scoring position from .213/.293/.303 to .266/.359/.435. Angel Guzman gets the start tomorrow. I'm expecting big things for two reasons: 1) He'll be pitching to stay in the rotation, and motivation is a powerful thing; and 2) He'll be facing the Nationals. Enough said. Or the warped workings of Something Greater? By the way, the record for such a streak (since 1957 anyway) among relievers is held jointly by Nelson Figueroa and Wilbur Wood, who both made appearances in a loss 41 consecutive times. Yup, each man went nearly four years without so much as pitching in a win. I almost felt sorry, but then I remembered: I'm a Cubs fan. Figueroa ain't got nothin' on me. Oh, and Eyre's streak, which began at the end of '06, was snapped at 12 after the Cubs won Wednesday. The Cubs went 4-1 on their road trip and are a mere two games below .500; the Nationals are 9-18 on the year. The Cubs need to take two of three; that at least puts the Cubs one game under going into another series with Pittsburgh. The team has allowed the fewest runs in the division and scored the second-most. Run differential says the Cubs should be 16-10. That could open the door for another Iowa starter, such as so-so performers Carlos Marmol and Les Walrond, or even Wade Miller, who was dropped from the fifth-starter role when he pitched poorly in three April starts, then went on the disabled list with back spasms. The Cubs wouldn't need a fifth starter until May 12, and Miller would be eligible to come off the DL by then. Well, suddenly Guzman doesn't sound so bad. UPDATE: It seems I can't read a schedule. Fixes have been made.